Are flowers as big to you as a tree to me? Is that wet petal like a mountain slope? Do you dream? What is your hope? I care about you, you see. Without you, there might be no me. I also love the white here! I lean in and take pictures! ❤ Aw Brenda this is SO lovely. The poem is perfect and the photograph of the Bee even more so. 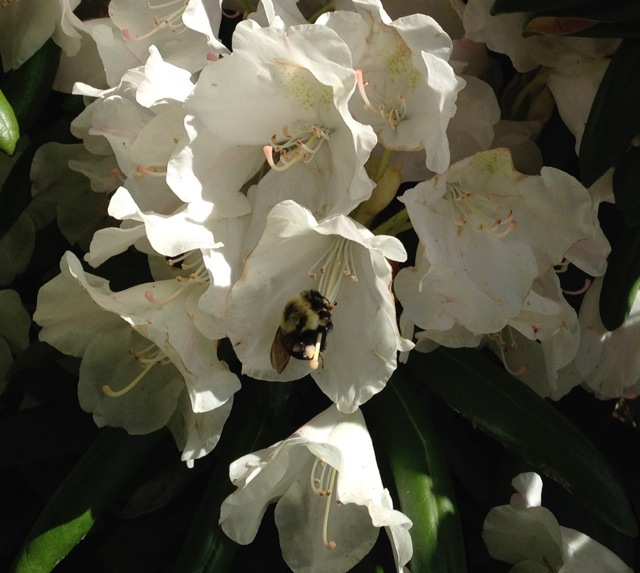 I adore Bumble Bees – and love to watch them collecting their 'swag'. I'm quite sure my neighbours must think I'm crazy – I've been known to follow a Bumble Bee around my garden, watching it as it stops and tastes all my flowers. Some of us just love the natural world. I sat on my bench at dusk one day for 20 minutes watching a bat pluck insects out of the air, and it was amazing, the speed and agility. I mentioned it to everyone walking by, they must have thought I was crazy. It looked like a bird, but if you really watched, it’s wings had to be those of a bat. I’d have sat down and enjoyed the ‘show’ with you. This is a GORGEOUS blog–love those purple flowers in the header–WOW. Such fun, thanks for the smile. sweet innocence. 🙂 This reminds me of William Blake’s Tyger and Lamb poems. Sorry for truncating the titles. Oh, yes, I love those. What lovely poems to be compared to, thank you! So true! And such a great photo of the bee hanging on (for dear life?) to the flower. That’s good to know! It was simply providing you with a perfect pose. OH! to see the world from an insects point of view! It must be quite beautiful. The macros people have been taking of flowers are amazing: the patterns and details on tiny things. And those compound eyes, I wonder if they see three-dimensionally in a way we can’t. I know, and I love them for it! It is just that they stung me pretty badly when I was a kid, and that fear is still in me , it was so painful! I love them too – my name means honey-bee in Greek!